← Theories or What Does the Least Damage? This entry was posted in Autism, communication, Parenting, presume competence and tagged assumptions, autistic, body/mind, body/mind disconnect, conversations, conversing, Emma Zurcher-Long, including, interpreting words, miscommunication, non-speaking, RPM, writing. Bookmark the permalink. So, now does she keep her keyboard with her so if that happens, you can ask her what she meant or does she mainly only use her keyboard in her sessions still? Understanding this now, I would hope that if I am at a table with someone who has unreliable speech and they say an unrelated word while there is a discussion going on, that I would ask them to explain (assuming they have a keyboard or some other way and I can speak). My speech is unreliable in the fact that I just can’t say anything at all no matter how much I want to. I do also mix up words when I speak and can’t think of the right word. Some other word will come out like “poury thingy” for gravy boat. I always have her keyboard with us where ever we go. Our goal at this point is to have more people with whom she will type. This is interesting. I have known for many years that there is a huge chasm between the spoken me and the written me, which, depending on how people first ‘meet’ me, can have a big impact on their evaluation of me. I never understood why there is this disconnect between my brain and my tongue, yet the connection between my brain and my fingers is, more often than not, like a river; the words flow with such ease, gliding over any rocks without any stalling. People respect me, they value my opinion and want to know more. Yet when I speak with my mouth…. It’s like I’m two totally different people, and that flow is choppy and I hit every single damn rock and stone, which means people will talk over me, ignore me, and cast aside what I have to say as having little or no value. If they’ve only met me through the written word, they can’t marry up the me they know with the person in front of them, and vice versa I suppose. Only recently, in my exploration of Aspergers and Autism, have I started to gain a sense of why this is so, and that is largely due to posts like this. Thank you, and Emma, so much for sharing and for helping others to understand the many twists and turns that come with this neurology. Really appreciate you sharing your own experience here. This sounds awfully familiar! I often wonder (like almost every time she does it) what Emma is thinking about when she blurts out something “silly” as she has put it. I hope that when I get better at typing with her (and if she becomes less taxed by the hard work of writing) that I’ll be able to ask her questions more frequently about her intentions. Was there any relevance or connection between the topic being discussed by others and the thing she said? It seems to me that Emma wants to practice verbal speech more often since she’s been writing. When we are out together strolling, she often voices a memory of an event that I also witnessed, and then looks at me expectantly. When I confirm that I remember the event too, and comment on it, Emma almost always says something else on the topic and we will go back and forth a few times. I think (but it’s another thing we need to ask her! ), that she wants to engage in a conversation and she chooses to discuss memories that I share with her, as that will minimize any explanations she’d have to give me if I couldn’t understand what she was saying on a more open-ended topic, like the ones she likes to discuss when she is writing. We have so much to learn from Emma! I wish I could just download all her thoughts at once but I’m sure my brain would explode! E’s SLP and I had a good laugh over his most recent IQ test coming out at 51 pts…we agreed “maybe if you added 100” ive said before, and I think that Emma’s “silly speech” is more of a hindrance to her than E’s no speech at all. Because he cant talk there is a consensus we dont know what he’s thinking…but because she can its assumed that what she says is what she thinks. I’m glad Emma is showing the way though because, if later, E can talk i have this wonderful background to know and share with those around him to remind us not to take everything at face value. 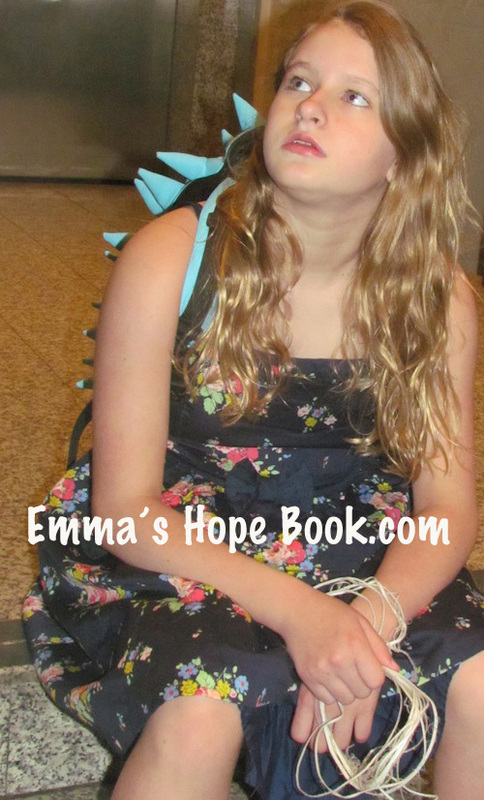 We were told Emma was “untestable.” Which… what does that even say about our standard IQ tests? I think having some speech certainly kept me from pursuing a variety of things early on. Because of course everyone kept upping the speech therapy hours even though it was clear pretty quickly that it wasn’t benefitting her. Yeah his has been upped a few times…started w 90 min a wk at 18 mos now at 180 but like i said yesterday she works much of the time on using his AAC, and using its keyboard for spelling, before that it was pictures…along with apraxia excercises when he feels like it. If it were only working on verbal speech id be in that position…his speech has really only had little spurts of sounds that come and go but overall hasn’t changed from videos i have of him at 9 mos so if the SLP were wholly focused on that and nothing else id prob pull him out. Right, and I know there are kids who’ve been helped tremendously with speech therapy, it just didn’t help Em. Her communication therapist at her school is terrific about emphasizing the communication piece without insisting on the method piece, which we all so appreciate. It sounds like you have some good people at E.’s school who also “get it”, which is really, really wonderful! My daughter Erin has no dx and is believed to have a rare gentic syndrome that is unknown. She has some words but often what comes out of her mouth is a series of the same words over and over again. While some of the words she uses are appropriate for the topic being discussed or are a request of something she would like to have happen. Other times they make no sense as far as we can tell. She also often laughs for no apparent reason. Through posts like yours and recent seminars I have attended we began to ask questions we never asked before. Through these questions we realized there was so much more going on inside of her and just no way to express it. Erin will often tell people “go home”. I was always baffled by this expression given that she is so delighted when friends or acquaintances come over. For years I was embarrased by this expression as most people took it to mean she wanted them to leave. One day it finally occurred to me that she might be asking to go to their house. When I asked her if that was what she was trying to say her face lit up and I knew that I had finally hit on the correct interpretation of what was meant by the words “go home”. However, many times she will say “Hi” to a friend and then call that friend the wrong name even though I know she knows their name. This post has helped me to understand there may be times when she knows what she wants to say but it doesn’t come out as if she does. She is just in the beginning stages of learning to use an AAC system. We have learned a lot about her since implementing the system but she often does not want to use it. I imagine much like Emma, it is difficult and time consuming and requires a lot of effort on her part. I have noticed that she will use it more when she is not asked to use it but when she controls when, where, how, etc. She will also use it only for things that really matter or when she wants to impress someone important to her. She will NOT use it if she has other means of communicating that will get her the result she wants without it. Thanks so much for all of your insights and for helping me to see my daughter in a different light. Your posts are helping so many people. Thank you! Jeannie – thank you so much for sharing all of this. Very interesting, the similarities are striking! E is the same w his AAC food and sometimes diapers…but then hes only 4 and when I get frustrated w his seeming lack of motivation to use it i go try to use the dang thing myself and its freaking hard lol and im an adult with no processing or motor planning problems…puts things in perspective i suppose. Thank you for writing this. My 13 year old daughter is considered verbal, but has an expressive language disability. I know she is listening and comprehending for the most part, but she has considerable difficultly joining in the conversation, especially if it is an emotional one. Sometimes the conversation is not being done in a way that she comprehends fully, so I check to ask her what she thinks or explain something that was said. She is highly intelligent, but sometimes the arrangement of words can cause issues. Often times I have had to explain directions for her school work in a different way than what is on the paper or what the teacher said. I have also had to break up the directions in chunks otherwise she gets overwhelmed. I taught her sign language when she was a baby and she continues to use signs, her signs. Not anything from a book, but signs that are meaningful to her and convey what she is unable to express verbally. I understand her signs, but it frustrates her that no one else does. What happens in this situation is that she goes silent and retreats into herself. People assume that she has nothing to say or contribute, but in fact she does. I have tried to teach her some American Sign Language, but I am not fluent in it. She also has coordination issues, so she has found that the signs for American Sign Language are difficult for her to make. That is way she modified the signs and created some of her own. She developed her own way of communicating. Not only does she sign, she also communicates by writing poems, stories, and songs. She has an amazing mind, like Emma does. Thanks so much for sharing about your daughter, Erin. She sounds wonderfully imaginative and creative! Man do I love this post, I love the introduction, the example is a brilliant way of putting that moment into view. Many need to read this. Our son is mostly verbal now, but he still resorts to writing when frustrated. When he was younger, he loved to watch the same video tapes over and over and over – behavior we associate with toddlers, but not 10 year olds. When he needed to express something and didn’t have the words, he’d quote dialogue from one of his movies. Recalling the scene, I would ask him if what was expressed there was what he was feeling. Echolalia? Sort of, but once I figured out that it wasn’t random, it helped me know what words to give him. I’ve seen several instances where once competence was presumed and the echolalia examined they came up with that same conclusion…something about it was words they had memorized and didnt have as much trouble accessing so they used it in a similar situation, or in a situation that made them feel like that part of the book/movie did. Another one of those things where they know what they’re doing it just takes a few lightbulb moments on our part to catch up lol. “Imagine for a moment if you had an idea. It was an idea that was in keeping with a conversation taking place by others in the same room as you, but when you opened your mouth to share your thought, instead of using words that would convey what you were thinking you said something that sounded like ……”. All human activity plays out across a vastness: a vastness our sensory-cognitive processing positions us within; a vastness we have in some fashion monitored and taken account off. A conversation taking place, involves the complexity of it incorporating several individual-positionings within this vastness, involves the complexity of it incorporating what has emerged from collectivity. Any normative and conventional and social and societal configuring of that conversation, complexly sets it against the backdrop of that vastness; actively and dynamically holds it in place in that vastness. The autistically developing individual has progressed individualistically and idiosyncratically regards monitoring and taking account of the vastness. Their sensory-cognitive processing and neurology, result from this individuating and idiosyncrasy, and in turn drive it. Autistic articulation with this vastness, is individualistic and idiosyncratic; while social/societal articulation with this vastness is crucially ruled by what the collective has determined about this articulation. The transactions in which this difference in articulation with vastness plays out, are pretty much beyond measure. That is they are taking place with a frequency we would find hard to track and map. What is in keeping with an already ongoing conversation, from an autistic point of view, rather bounces of the horizons of vastness, rather than being close to a conventional mapping of what that conversation is doing and is about. So the autistic person can seem to be coming at things from an odd or unworkable angle, from any conventional point of view. This is where the frequency and speed of transactions comes in. The autistic person is at risk of having their engaging shredded across this nexus of transactions; and at a speed difficult to monitor. The performance-integrity of the engaging autistic person, fragments: and what they say/do might end shaped by fragments of person; rather than by the wholeness of that person. Allegorically, conditions of reception have fried your intra-personal communication network, and units of person end acting on their own as best can; but your effect is way down from your integrated-capacity; not having overview, the actions of individuals units can end irrational across any big-picture perception. Presuming competence involves bringing vastness back into focus. Involves the determination to recover the integrity of the autistic other across that vastness. Emma has integrity across how her sense and cognition see her monitoring and processing that vastness, individualistically and idiosyncratically. Conditions of conventional social/societal reception can threaten her integration process; can stress it to where she is moved to expression by parts of herself rather than by the wholeness of her person. If and as we can withdraw from the big-battalion allegiance to what is collective and social/societal, with it’s Dolbied apperception of an environing vastness, then we can position to listen to our autistically developing children across a fresher and fuller sense of the vastness in which we occur. It’s putting the expressions of our autistic children in that frame of reference of vastness, that does the enlightening and emancipating trick. Jeannie’s story of Erin’s “go home” so speaks to this notion. Richard speaks to how Emma uses reference to reliable shared memories, to deal with the enormity of the challenge of positioning self across vastness, to provide a joint frame of reference in which that condition is satisfied. Richard himself, certainly as writer, invests enormous effort in providing just such joint frame of reference for and with his readers. It is something enormously challenging to do from an individualised and idiosyncratic starting point. It is enormously challenging for an autistic person to contribute to an ongoing socially-grounded conversation, in any way which draws on the whole of their autistic person. Their autistic frame of reference, it drawing on their take of vastness, has to articulate with conventional frames of reference which are through and through absolutely different. How much of any engaging project is going to make it through; what realtime attrition and diminution will occur across a transactional process proceeding faster than sense and cognition can track and map. What emergency self-preserving dynamics will what remains become subject to. My rant is rather triggered by a personal aversion to any suggestion that these life-difficulties stem from limitations of individual constitution. As I see things, all these life-difficulties stem from conditions of reception; conditions of reception in which collective process and dynamic is always most implicated.